Hands On Bike: Pletscher Kickstand Review! 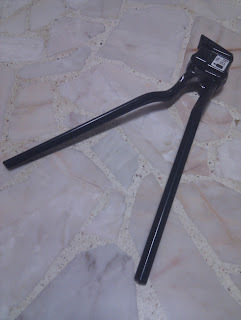 Just installed my new Pletcher kickstand today! 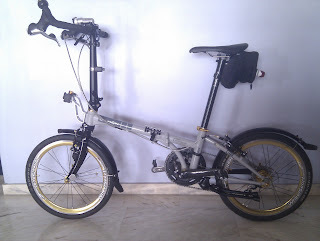 For those who do not know what it is, it is a highly acclaimed kickstand with double legs, that folds up to one side. 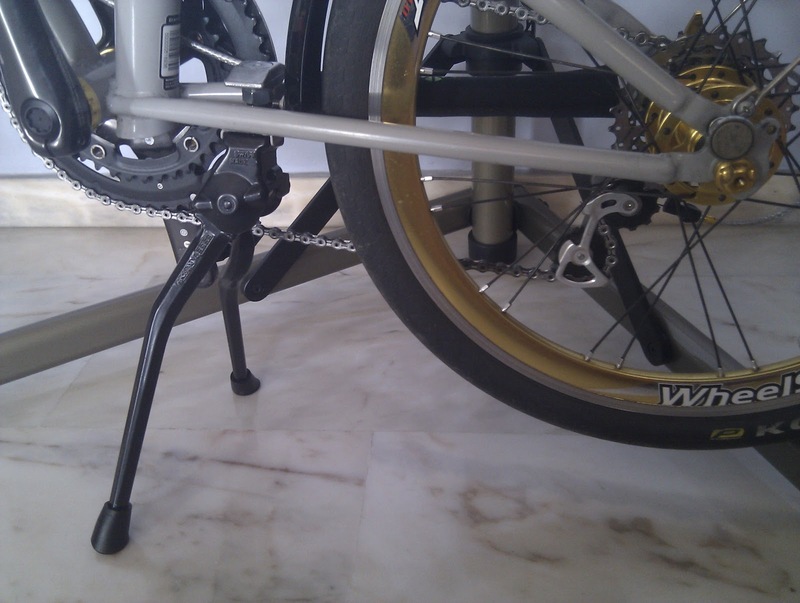 According to many people, this double leg kickstand makes it very stable and able to withstand heavy loads, especially for touring bikes! The whole kickstand is rather solidly built, such that initially I thought it was steel! But the whole kickstand is actually aluminium, but still rather heavy. However, installation was not as straightfoward as I thought. Initially I thought I could just swap out the kickstand, but it was not possible! From the first picture above, you can see that the bolt is quite long. In fact it bottoms out in the kickstand long before I have even clamped the kickstand on! What is worst is that the bolt is not of metric size, which means that I cannot just change to a shorter bolt that I have. It is probably something like 3/8 inch in diameter or something. In the end I managed to work out something, although it is not neat at all. 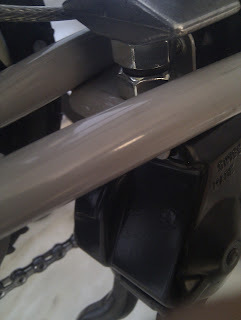 I had to use larger nuts as spacers in order to take up the extra length of the bolt. 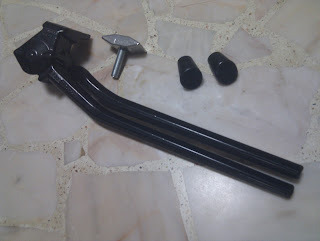 A word of advice here, if you plan to fix on this Pletscher kickstand using your existing kickstand mount, be prepared to do some fudging to make it work! 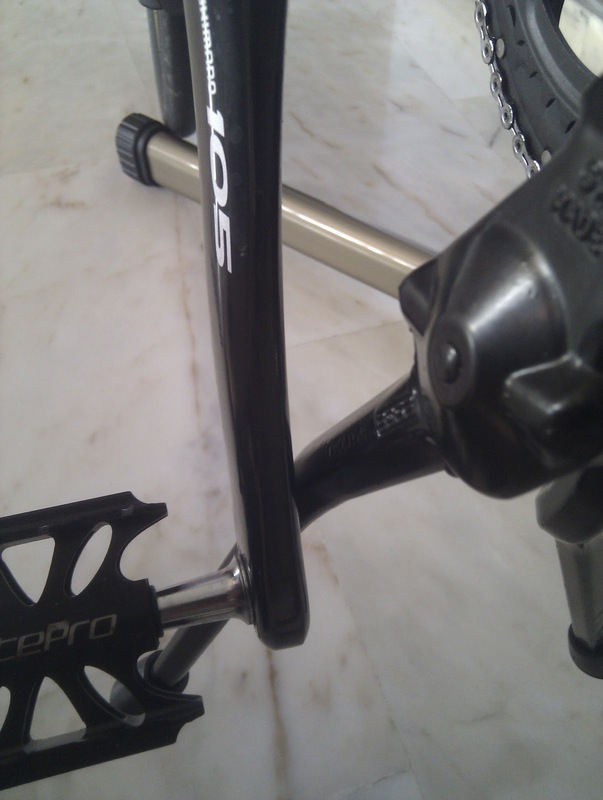 Uncut legs, puts my rear wheel 12 cm off the ground! Without cutting the legs of the kickstand, the long legs ended up lifting my rear wheel by 12 cm off the ground, which is far too much for me. 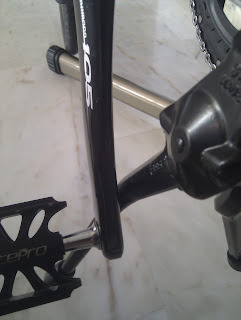 Had to cut the legs so that my rear wheel is not lifted so far off the ground. 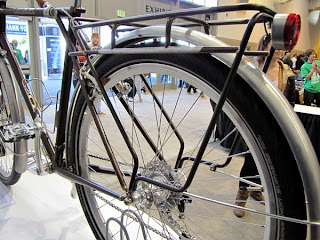 I would prefer that the rear wheel be lifted by maybe 3cm off the ground. 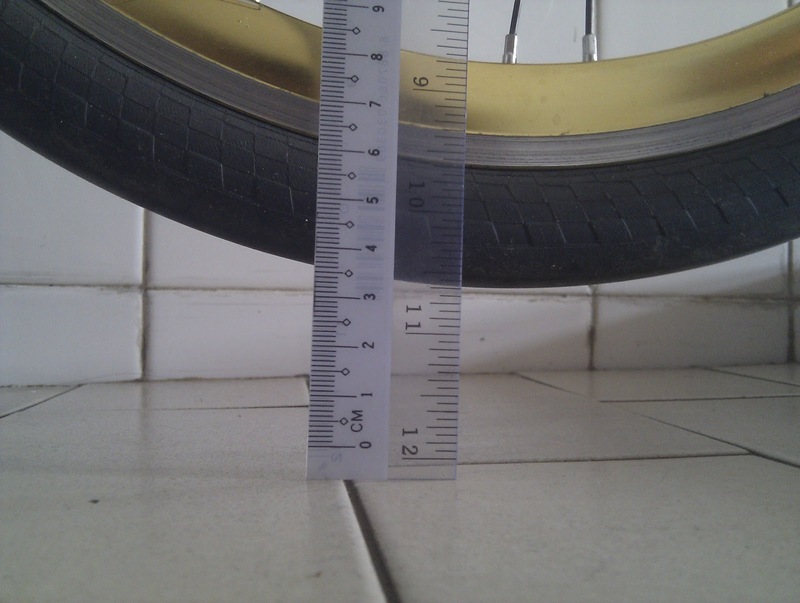 However, do not cut 12-3=9cm off your kickstand leg! Because the distance measured is at a different place, cutting 9 cm off your kickstand is likely to make it shorter than the wheel, and your kickstand would be useless. Original length as embossed on the leg is 320mm, decided to play safe and cut at the 270mm mark, which means sawing 5cm off. To do this, of course you need a saw and some arm power! Luckily it is aluminium and not steel, so it is not too tough. After putting on the rubber shoes, here it is! Rear wheel is about 4cm off the ground! After putting on the rubber shoes, the rear wheel is found to be lifted off the ground by 4cm. More than what I was looking for, but no problem at all. Too lazy to cut the kickstand legs again haha. I would rather leave it longer, and trim later on if needed, than have it too short. Unfortunately, the left crank will still hit the kickstand leg. I remember seeing on another bike where the crank will clear the kickstand leg, but the geometry is probably different on that bike. 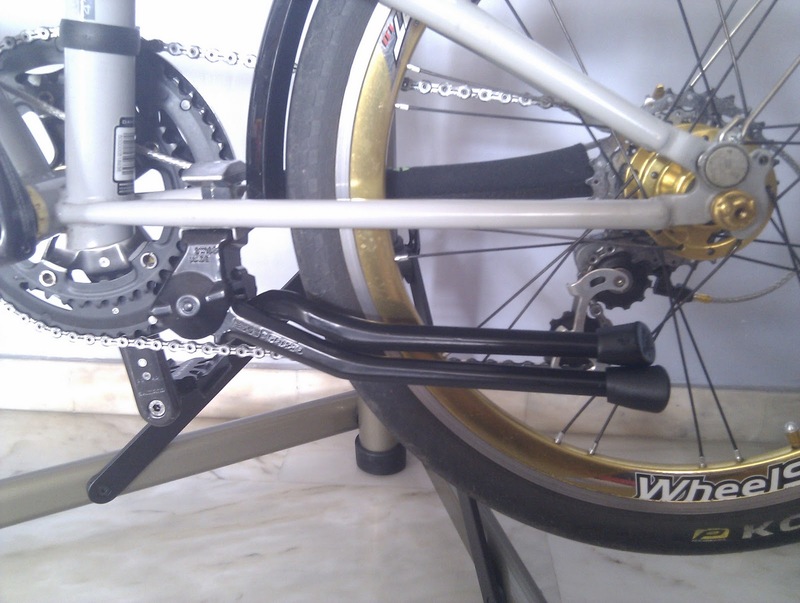 This means that roadside tuning of the bike that requires spinning the cranks is still not possible. However, changing tubes is made easier, since the bike can be see-sawed so that either the front of rear wheel can clear the ground. Then some of you may ask: Why change to this kickstand in the first place and suffer the weight penalty? 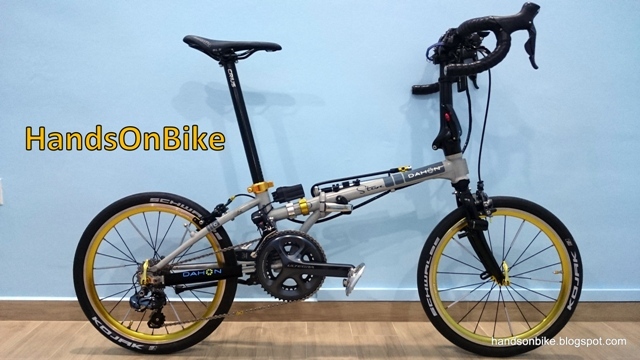 This is not because I want to add panniers or something, but because I want to enable my Dahon Boardwalk to be folded and rolled along easily! Wondering how I can do that with the Pletscher kickstand? Watch out for my next blog post! 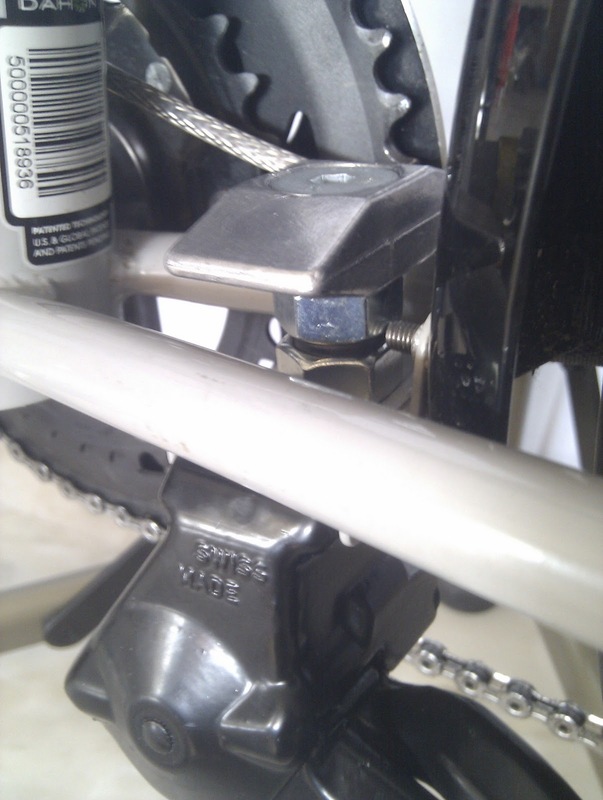 Earlier in the post, I was saying that the bolt was not metric, which means I cannot just substitute another shorter bolt for the kickstand. In fact I wrote an email to Thorusa regarding this matter. They were very nice to actually send me a collection of bolts of different lengths, in order to solve my issue with the bolt that was too long. 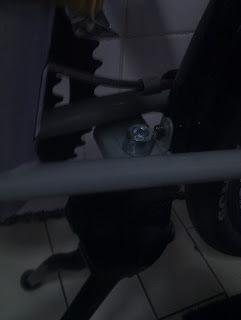 I just received the bolts a few days ago, and I used the short bolt to mount the kickstand directly to the frame as shown below. Apologies for the poor picture quality. 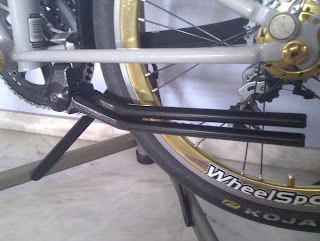 With this shorter bolt, it now looks very similar in mounting to the original Dahon kickstand! And since the extra nuts and spacers have been removed, and a shorter bolt is now used, the total kickstand weight has dropped to 550g. Still not lightweight, but definitely an improvement! Most importantly, it now looks much sleeker, without the stack of spacers as previously used! Thanks Thorusa for the wonderful customer service and advice. Wish there were more online bikeshops with your level of service and expertise! Thanks for your review, I am looking for a kickstand and after reading about many of them, I think this one is the proper for my bicycle. I have a doubt, Could you tell me the measure of the above sheet? (Picture 3), I am not sure If I have enough place for it. Where to buy this stand?